Summary: Patios are great for any occasion. When decorated properly, it can portray a gorgeous setting that’s perfect for any event or gathering. 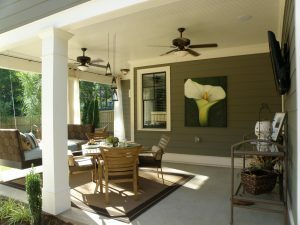 A patio can be a fun place for any homeowner looking for a place to catch up with some “R&R”. Creating it from scratch can be a pretty difficult task if you’re new to exterior design. Here are some tips that you can use to turn your patio into a mini-vacation area that’s great for the whole family. If you have a small patio, one aspect that you’ll want to consider is the visual space of the entire area. You can actually make it look much larger than it actually is by utilizing a minimal design and placing small decoration pieces. Remember, the more cluttered your patio is, the smaller it’ll essentially look, so be aware that you don’t overdo it when it comes to furniture pieces. In order for you to sit and rest, you’ll want to have some nice furniture pieces that are both comfortable and weather-resistant. If you choose pieces that aren’t designed to withstand the everchanging weather patterns, it’s likely that it’ll end up rusted over or warped and out of shape. Additionally, any furniture piece that has cushion foam inside of it should be removed and stored away when not being used. Keeping it exposed to the sun for example, will cause it to become distorted and lose its’ original color over time. If you’re purchasing some new furniture accessories from The Foam Factory for example, and want to decorate your patio, be sure that you choose a specific pattern that you want your furniture set to match. A wide variety of colors might sound like an interesting concept but if you don’t have a visual flow, you’ll throw the entire design off balance.